Product information "XMC Digital Power Explorer Kit - KIT_XMC_DP_EXP_01"
The new XMC digital power explorer kit utilizes Infineon’s industry leading XMC range of ARM® Cortex™-M microcontrollers, OptiMOS™ BSC0924NDI MOSFETs and IRS2011S high and low side drivers. 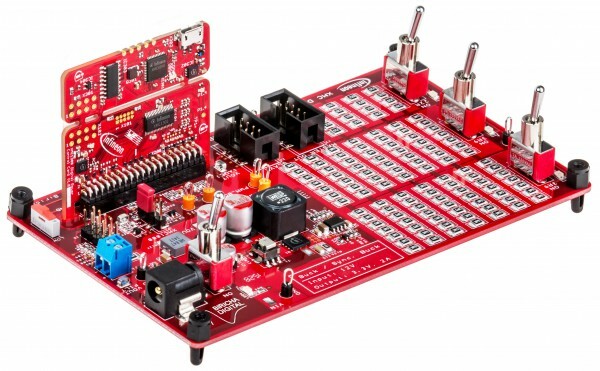 The kit’s power board features synchronous buck converter with on-board resistive load banks. The load banks can be switched between 10%, 55% and 100% of the maximum load, so that the transient response and the quality of the control loop under different load conditions can be tested (for example continuous conduction mode vs. discontinuous conduction mode). The kit also includes 2 different control card options, XMC1300 control card (ARM® Cortex™-M0) and XMC4200 control card (ARM® Cortex™-M4F) with isolated on-board debugger, which allow designers to easy evaluate both XMC microcontroller families and make the right price/performance choice for their application. Multiple test points are provided on the power board for check ing the quality of all the relevant signals. Communication option via PMBus™ is provided for easy integration in more complex power management systems. The kit was developed in collaboration with Biricha Digital Ltd. and Würth Elektronik. Related links to "XMC Digital Power Explorer Kit - KIT_XMC_DP_EXP_01"
Customer evaluation for "XMC Digital Power Explorer Kit - KIT_XMC_DP_EXP_01"